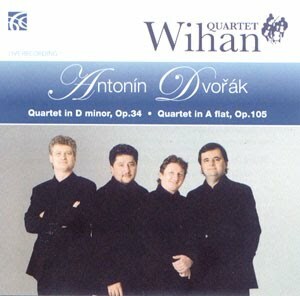 The Dvořák quartets represent a relatively crowded corner of the repertoire when it comes to commercial recordings, but there a few things about the Wihan Quartet's continuing series that have the potential to set them apart. From this performance, it is clear that they are heirs to a strong tradition of Czech string playing. The name is instructive; Hanuš Wihan was the cellist of the Bohemian String Quartet, whose many premieres included the Dvořák Op.105. And much as I love the violin playing on these recordings, it is the viola and cello that really shine. That suggests a certain democracy about the way this music is played. This too chimes with the composer's approach to the ensemble, he was never one to forget about the lower strings, and while the music is usually melodic and homophonic, the activity in the lower voices is what brings it to life. The recording was made live at the Convent of St. Agnes in Prague. It is a good acoustic, a little boxy perhaps, but only serves to increase the intimacy of the sound. For all the Bohemian colour in this performance, there is also a certain restraint. The players never launch themselves into the folk melodies or abandon the pulse in favour of free rubato. I wonder if the ecclesiastical venue has tempered their passions? Perhaps not, I think it more likely that my surprise at the sophistication of these interpretations is due to a stereotypical view of Czech performance as only a step removed from rustic peasantry. I happily stand corrected, and salute the Wihan's impeccable refinement. But, as I say, there is little in the way of excess here. There is plenty of light and shade, and plenty of dynamic contrast, but the timbal palette and the range of dynamics is strictly limited. There tone is not warm as such, and there is always an edge to it. But this too works in the composer's favour, it means that the melodic lines are always clearly defined, even in his more complex developmental passages. Of the two quartets, the Op.105 is the better, both in terms of composition and performance. The players' occasionally dispassionate approach risks trivialising the climaxes and sectional contrasts in Op.34. There are some occasional tuning problems in the violins in Op.34 as well, although these are less of an issue in Op.105. The latter work is by far the more famous, and I wonder if its superior performance here is has benefited, or is a response to, the many recordings that already exist. It is more constrained than many readings, but the music gains an inner life through a very localised rubato. Take, for example, the cello turn figures that open the first and last movements. The duration of each of these phrases is in tempo, but there is a perceptible ebb and flow between the durations of the individual notes. It is a great approach, ensuring the metric structure of the movements and sections, while always allowing the melodies to breathe. One final commendation, to the cellist Aleš Kaspřik. In many ways, he is in the ideal situation. The quartet as a whole play with a directed, focussed tone, and that is always going to benefit the cello over the (potentially screechy) violins. The acoustic also favours his tone, and his sound is always crystal clear, whatever the scoring. Nevertheless, he is clearly a very fine player indeed. He is able to continually balance the chamber music paradox of sounding like a soloist and an ensemble player at the same time. Like the rest of the ensemble, he can create drama in the music without resorting to extremes, and the quartet's variety of textures is founded on his range from the guttural and woody to the focussed and lyrical. He is the quartet's secret weapon. Fitting indeed, then, that they are named after Dvořák's cellist.